In the 1990s, supermodels like Claudia Schiffer, Cindy Crawford and Naomi Campbell posed in the buff for People for the Ethical Treatment of Animals (PETA) under the slogan "I'd Rather Go Naked Than Wear Fur"—part of initiatives that helped make fur politically incorrect. Two decades later, mink and fox fur have become regulars in the most prestigious fashion shows. According to www.fashionista.com, 70 percent of designers used fur in their fall-winter collections in 2013, a trend that seems set to continue in this year's shows. Some professionals think the comeback may be due to the financial crisis. "If you're in a situation where the economy is on a downward trend, politicians tend to focus on essentials—how to get economic growth going again, securing jobs," Fur Europe lobby head Bo Manderup said. "The luxury of political correctness may have gone down the drain with the financial crisis." In the last 10 years, global mink fur production has doubled, reaching 66 million skins last year, according to Finnish auction house Saga Furs. Despite the rise of Chinese producers, Europe still tops the world ranking, with Denmark in first place. Some 1,400 Danish farmers exported mink fur worth 13 billion kroner (1.7 billion euros, $2.4 billion) last year, making it Denmark's first export to China, where the skins are processed and some even commercialised. Subject to the recommendations of the Council of Europe, which requires a minimum cage size—0.8 square metres (8.6 square feet) for foxes and 0.225 square metres for minks, the industry has created labels that aim to certify the origin and well-being of the animals. The initiative was labelled a "green-washing" attempt by Austrian animal rights association Vier Pfoten (Four paws), which recently released footage it claimed came from a farm in Finland, the leading European fox fur producer. The Finnish farm's skin boasts the "Saga Furs" label, which is supposed to stand for "responsible practices". The Austrian association, however, asserts that the conditions under which it operates are equivalent to "torture". The footage features tailless foxes, a possible sign of cannibalism, and others suffering from obesity due to insufficient physical activity or living on top of piles of excrement. 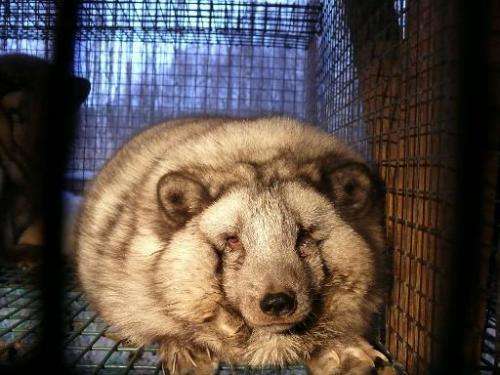 "This shows that there is no animal-friendly fur-farming," Vier Pfoten's wild animals expert Thomas Pietsch said. Besides their well-being, animal rights activists claim that it is ethically unjustifiable in 2014 to breed and kill animals, usually with gas for minks and electrocution for foxes. "Some people eat meat, some don't. And I'm of course respectful of such a choice but it's a personal, not a societal choice. Equally for fur: some people like it, some don't like it," lobbyist Manderup said. "The animal doesn't really care whether it's eaten or whether it's worn." Improved techniques and marketing efforts have revamped the image of fur. The long dark mink coat is dead. Rejuvenated fur now comes in the shape of accessories: collars, belts or hoods. In the fast growing Russian and Chinese markets, fur has become a status symbol, just like German high-end cars or designer handbags. As a result, mink prices have risen in recent years, attracting new entrepreneurs. For the first time in 20 years, Sweden has seen a growing number of fur production farms, thanks to the interest of young farmers looking to create their own business and pig and dairy farmers looking to increase their revenue. But the mink price rise has boosted the offer to the point of surplus. Together with a mild winter in China, the excess has caused a 26-percent price drop in the December auction, according to Danish house auction Kopenhagen Fur, the largest in the world, which said it failed to sell 80 percent of the merchandise. Professionals say they expect the prices to stabilise slightly below former record-high figures. But the industry's critics have not given up. Their actions can take a violent twist, as in Sweden where farms are attacked and some owners have been threatened and physically assaulted. These radical activists, "draw a parallel with the Nazi concentration camps", said Kerstin Jacobsson, sociology professor at the University Gothenburg in Sweden. "They have difficulties understanding that mainstream society can be blind to this suffering." Some countries have taken a firmer line on the trade, siding with animal rights groups. The Netherlands, the world's fourth mink producer, said it would completely ban the activity in 2024. "A blow to the fur industry," according to fur trade professionals. Norway, responsible for 1 and 4 percent of the world's mink and fox production respectively, has set a December 2014 deadline for proposals on the future of the industry: either dismantling it or developing it in a sustainable way.